Coca-Cola is the world’s largest soft drink manufacturer, and one of the most recognised brands in the world. Yet for many people throughout Latin America, it is instead known for its use of human rights abuses to quash the unionisation of its workers. The centre of this dispute has been the bottling plants throughout Colombia, the most dangerous place in the world in which to organise a union, where workers have been targeted by a concerted campaign of violence, kidnappings, and even murder. In fact, since 1990, nine union leaders have been killed by paramilitary organisations with known links to Coca Cola management. 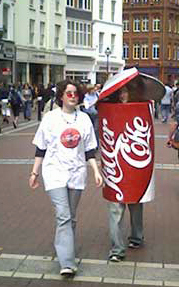 In 2001 and 2006 the American-based United Steelworkers and the International Labor Rights Fund brought lawsuits against Coca Cola on behalf of SINALTRAINAL, the Colombian food and beverage union. In spite of multiple testimonies and independent reports corroborating their allegations, a Miami court found in favour of Coca Cola, and all charges were dropped. While the Colombian case is perhaps the most well-known Coca Cola controversy, it is by no means the only one. Guatemalan workers have reported similar abuses, while Coca Cola’s sugar suppliers in El Salvador have been documented using child labour in dangerous and exhausting sugarcane harvesting. In Mexico, the country with the world’s highest per-capita consumption of Coca Cola, the company has been accused of building a monopoly, avoiding taxes, and using its political and economic clout to buy up vital water concessions for bottling and dumping, many of which lie within indigenous areas. LASC has been an active source of support during these disputes. In 2003, LASC hosted two members of SINALTRAINAL, giving them a platform and a chance to express their views without fear of repression. LASC member Gearóid Ó Loingsigh also went to Bogotá as part of this mutual exchange, and interviewed SINALTRAINAL president Javier Correa. 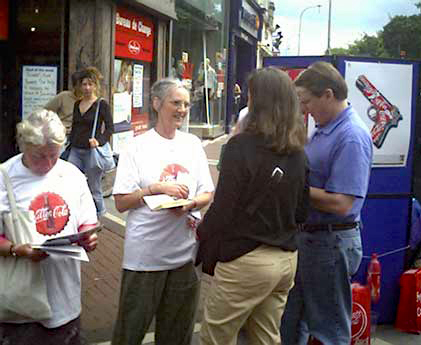 We also campaigned extensively to boycott Coca Cola products, reaching several important successes and alliances including the support of well-known bars in Belfast and Derry, SIPTU, and the Student Unions of Trinity College and UCD.